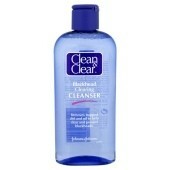 Removes trapped dirt and oil to help clear and prevent blackheads. For clean, noticeably clear, beautiful skin. Clean & Clear® Blackhead Clearing Cleanser is specially formulated to clean away oil, dirt and grease trapped deep in the pores - the impurities that can lead to blackheads. It also contains a blackhead-fighting ingredient and helps clear and prevent blackheads from coming back. The tingling sensation tells you your skin has been thoroughly cleansed, leaving it feeling really clean, clear and refreshed. Aqua, Alcohol Denat, PPG-5-Ceteth-20, Glycerin, Salicylic Acid, panthenol, , chamomilla recutita extract, aloe barbadensis gel, bisabolo, propylene glycol, glucose, butylene glycol, menthyl lactate, sodium benzoate, parfum. This product was effective at removing dirt and excess oils from my skin but almost instantly my skin felt tight and sore so I had to remove it, however I was left with blotchy skin. Pad came away with grime so showed it pulled out the dirt. Irritated my skin and had to wash off. I found it was easy to use and the scent was not too overpowering. The product irritated my face and I had to stop using it.